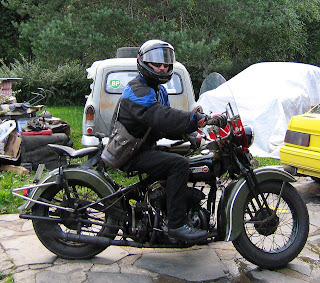 American Motorcycles Norway / Veteran-Mc.com: My -39 W 45"
I am the second owner on this -39 W.
When i got the chance to buy this bike from the relatives of the previous owner it needed a full overhaul on any moving part whatsoever. Changed every bushing, bearing, needle roller etc etc. Even if the W is not a very powerfull bike this is the bike that gets most mileage.